DESCRIPTION An attractive and beautifully landscaped PERIOD COTTAGE situated within the highly regarded location of West Chiltington. Internally the property retains much charm and character although it remains not listed. Features include: generous sitting room with FEATURE INGLENOOK OPEN FIREPLACE, 17' entrance hall/study, separate dining room and kitchen. 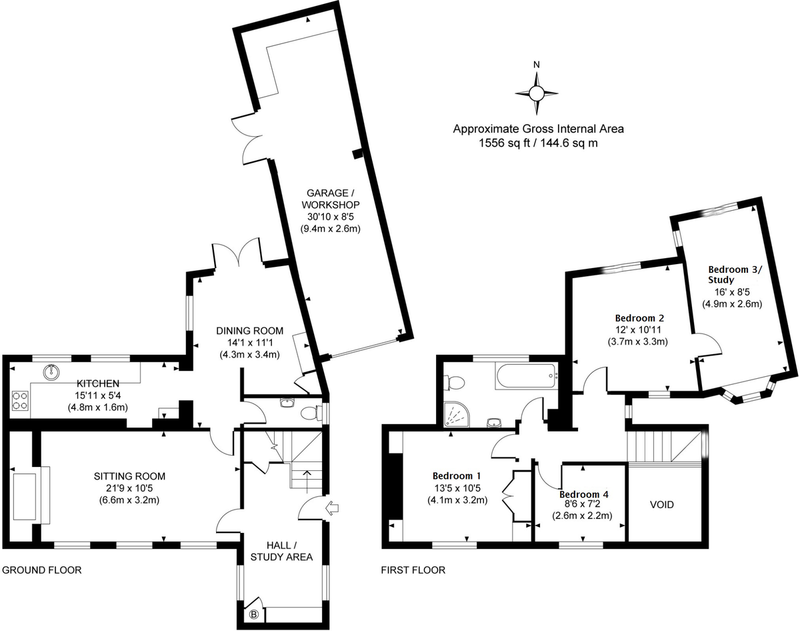 Upstairs, the property has been extended incorporating a further bedroom three/study and family bathroom. Outside, to the rear there are delightful cottage style gardens and terrace measuring approximately 120' and to the front there is gravelled parking for two vehicles leading to a 30' TANDEM LENGTH GARAGE and workshop. Early viewing is advised. RECEPTION HALL/STUDY 17' 10" x 6' 7" (5.44m x 2.01m) Radiator, exposed beamed ceiling with open plan staircase leading to first floor. GROUND FLOOR CLOAKROOM Low level flush w.c., wall-mounted wash hand basin with toiletries cupboards under, concealed spot lighting, double glazed windows. DINING ROOM 14' 1" x 11' 1" (4.29m x 3.38m) Radiator, dual aspect double glazed windows with French doors leading to terrace and rear garden, storage and display cupboards, exposed ceiling beams. KITCHEN 15' 11" x 5' 4" (4.85m x 1.63m) Galley style kitchen with inset one and a half bowl stainless steel single drainer sink unit, range of laminate wood style working surfaces with drawers and cupboards under, space and plumbing for washing machine, dishwasher, integrated fan assisted electric oven and four ring hob with extractor over, range of eye-level cupboards, 'Worcester-Bosch' combination boiler, double glazed windows overlooking rear garden, exposed ceiling beams, part tiled walls. FIRST FLOOR LANDING Bookshelves and side window. BEDROOM ONE 13' 5" x 10' 5" (4.09m x 3.18m) Radiator, double glazed windows, built-in wardrobe cupboards, chimney breast with exposed oak beam, recessed shelving with cupboards under. BEDROOM TWO 12' 0" x 10' 11" (3.66m x 3.33m) Radiator, double glazed windows. BEDROOM THREE/STUDY 16' 0" x 8' 5" (4.88m x 2.57m) Step up, triple aspect double glazed windows with window bay, two radiators, access to loft space. BEDROOM FOUR 8' 6" x 7' 2" (2.59m x 2.18m) Southerly aspect room, double glazed window, two exposed oak beams to walls. FAMILY BATHROOM Panelled bath with separate enclosed semi-circular shower cubicle with fitted independent shower unit, low level push flow w.c., inset wash hand basin with toiletries cupboards under, heated chrome towel rail, double glazed windows, concealed spot lighting, fully tiled walls. REAR GARDEN 120' 0 approximate" x 37' 0 approximate" (36.58m x 11.28m) Being a feature of the property with steps up to large paved terraced area with shaped lawned areas enclosed by brick walling with raised paved terraced patio, further step up to paved pathways with further shaped lawned areas, screened by mature trees and shrubs (including rhododendrons, azalea, choisya and lavender), outside water tap, door accessing garage/workshop. SERVICES Mains gas supply. Mains water supply and drainage on a shared system with the adjoining cottage.